Since his creation one hundred and twenty years ago, the name of Dracula has become synonymous with the legend of the vampire and the character is one of the world�s most iconic to appear in fiction and film. 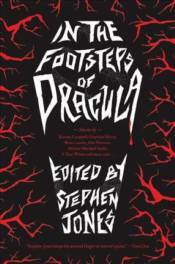 Now, this history of the blood-drinking nobleman follows Dracula from his origins in Transylvania, through his travels down the decades, into a dystopian twenty-first century where vampires rule the world.Is it possible that the Count�s condition can be cured by modern medicine? How does the mythology perpetuated by literature and movies affect the existence of a real bloodsucker? How can an immortal creature adapt to the social and technological changes that have already shaped our modern world? And what happens when Dracula turns up for his own birthday party?These and many other questions are answered by acclaimed authors such as Ramsey Campbell, Christopher Fowler, Charlaine Harris, Nancy Holder, Nancy Kilpatrick, Brian Lumley, Graham Masterton, Paul McAuley, Kim Newman, Michael Marshall Smith, F. Paul Wilson and many others, including Dracula�s original creator Bram Stoker with a long-lost version of the story first presented in 1897.